Confession time! I don't like to exercise. It's not something fun or something I look forward to doing. In fact, I can come up with a million excuses to get out of any form of exercise. I didn't always feel this way. I was a cheerleader from the time I was 7 and through high school. I loved cheerleading and despite what you may believe, it's a tough sport. I was constantly training and in shape for competitions, stunts, games, and performances. Running was a part of the deal. I never enjoyed the running part, but it was part of the deal and I did it. Before my son was born (20 months ago) I had a gym membership and a personal trainer. I was trying to get in shape. My personal trainer was a Marine and great at pushing me. He didn't put up with my whining and "I can'ts" like my husband did. After I found out I was pregnant, I visited the gym a few more times and then never again. I used my pregnancy as an excuse which is completely ridiculous! After my son was born, I began to lose weight very quickly thanks to breastfeeding. I was one of the lucky ones. I was on the very low end of a healthy weight and my husband and doctor had their concerns. Me? I was thrilled! What an easy weight loss plan! When my son weaned 10 months ago, the weight quickly (very quickly) came back. I keep telling myself that I just need to get pregnant and not worry about losing weight, but unfortunately, getting pregnant isn't an easy task for me. So while I wait, I'll get in shape! My son has always loved being outside and anytime he's fussy or having a bad day, a walk in the neighborhood solved all of our problems! My husband likes to run, so I tried to run with him. Unfortunately our umbrella stroller isn't made for running. I was using the inconvenience of not owning a jogging stroller as an excuse. But, it's not an excuse anymore! PishPoshBaby has sent me a Baby Jogger Summit X3! This stroller is GORGEOUS and just the motivation I needed to get outside and start running! The black and grey fabric looks so sleek and despite how big this stroller is, it's incredibly easy to maneuver and not heavy to push at all. My toddler is so comfortable hanging out in the seat and I really love how the canopy completely keeps the hot sun off of him. The staff at PishPoshBaby are stroller experts! If you're looking for a new stroller (or other baby gear) check out the Mom Chat feature where you can ask real moms for advice on the products you are interested in. If you are local to the PishPoshBaby store in New Jersey, you definitely should visit! They have a car inside the store so you can see how easy it is to install a car seat or take a stroller in and out of the trunk. There's a road inside the store with speed bumps to test drive your stroller as well! 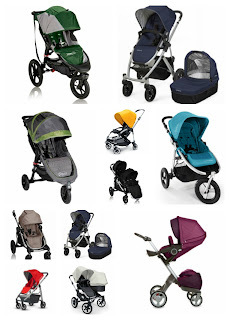 Check out my Pinterest board for a collection of some of the hottest strollers sold at PishPoshBaby! I'll be training using the Couch to 5k program. The program is broken up into weeks with intervals of running and walking. Each week the running intervals increase. It's a great program to start with when you aren't a runner at all (like me). The program is broken up into 8 weeks, but only plans for 3 days of running each week. I love this because I can take a day off when life gets in the way or if I need a day of rest, but I can also repeat a day in the week if I feel I'm not quite ready to progress to the next week. Each week, I'll be posting about my progress. I hope you'll follow along to learn more about the Baby Jogger Summit X3 stroller and cheer me on! I could use your support! How many of you are runners? Do you have any tips for me? What stroller do you prefer when hitting the pavement with your little one? Congrats on your new 5K program! Running Advice: 1) I LOVE my Nike+ app on my iPhone because I can pick a distance or time and Nike will count down with famous athletes cheering me on during and after my run in my headphones. 2) Go get fitted for running shoes at your local running store. Don't just pick up any nikes from Kohls or Foot Locker, expect to pay about $80-100. 3) Find a 5K race in a few months that you want to run and pay for it so you are committed with the entry fee and it is on your calendar. Maybe a color run, girls only run, or food related race. You sound like me! I can always find some lame excuse to not exercise. lol Good luck with your progress! Definitely looking forward to following along with you on this! I'm interested to learn more about the Baby Jogger Summit X3 too! Oooo, I can't wait to see how it goes! Be sure to keep us posted! That is exciting! I wish it would warm up here so I can take the kids out for walks again. That stroller looks so sleek! We live in a rural area and the roads are pretty rough. So a stroller with wide, durable tires is very important to us! Love the Couch to 5K app :) I agree about getting fitted for shoes, it really does make a difference. Also, pay for the race and you will be more motivated to do it. I have paid for half marathons and only ended up completing them because I didn't want to throw away the money. Looks like a great stroller. I am not a runner by any definition of the word. I just use my jogging stroller to take my daughter for walks. Works great for walking up to the grocery store. The big basket underneath works as a cart for my groceries. I can't wait to hear more about the stroller. I'm not into exercising at all either. (Which is why I still have some belly flab left after giving birth!) Now that it's warm, we've been doing our morning/afternoon walks, but I need to get a work out plan in motion. Good luck, I'll be cheering you on! You can do it! 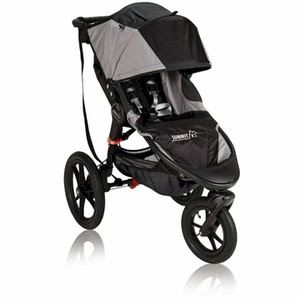 I'm a stroller runner with my Britax B-Agile. I usually run on the pavement. I find that I get more of a workout when running with the stroller. They key for me is to hold on with one hand and use your other hand to assist with your running motion. Also, lock the front wheel! Great job on being motivated to get into gear! Mine are out of the stroller so it's a bit harder to take them running. I'm doing the couch to 5k program right now! I've been on the lookout for a jogging stroller and this one looks awesome!